It was almost midnight when we arrived at our hotel in District 1 but we weren't able to explore until the following day. 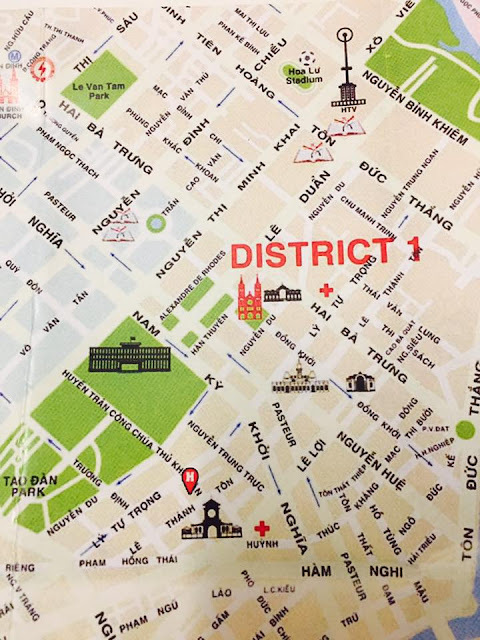 Ho Chi Minh City is differs greatly from Bangkok and Kuala Lumpur since most of the restaurants are already closed by 10 - 11pm. And even if our hotel is just several meters away from the famous Ben Tanh Market, the street was already dark. 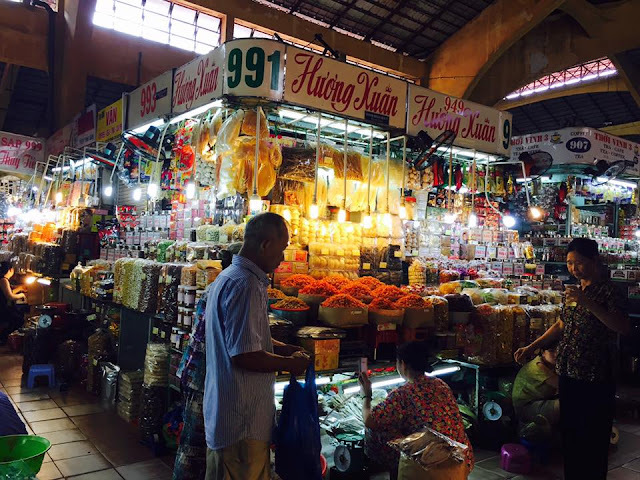 The following morning, my friend and I made our way to check the famous Ben Tanh Market. The idea of shopping precedes our grumbling tummies this time. Food stalls greeted us upon entering the market though. So many delicious-smelling food filled the air. I can only identify pho and fresh spring rolls or goi cuon. Aside from food, clothes, bags, paintings, souvenirs, fruits, and other fresh produce, Ben Tanh is a haven for coffee lovers. There's a section dedicated to coffee beans and you can just imagine the aroma of freshly grind coffee hitting you and waking up all the other senses. So in short, that's our cue to listen to our grumbling stomachs. We decided to explore the surrounding area for food. 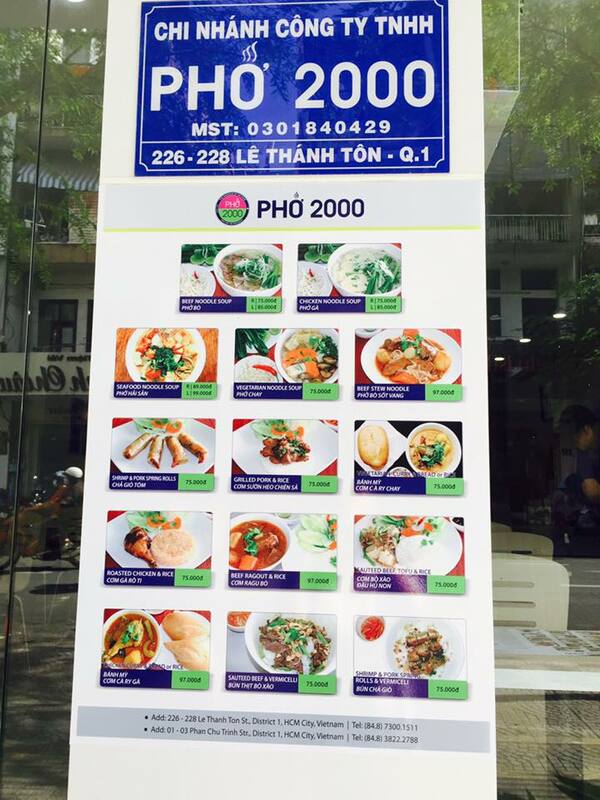 Alas, even choosing which resto to eat pho or banh mi is such a hard thing to do. 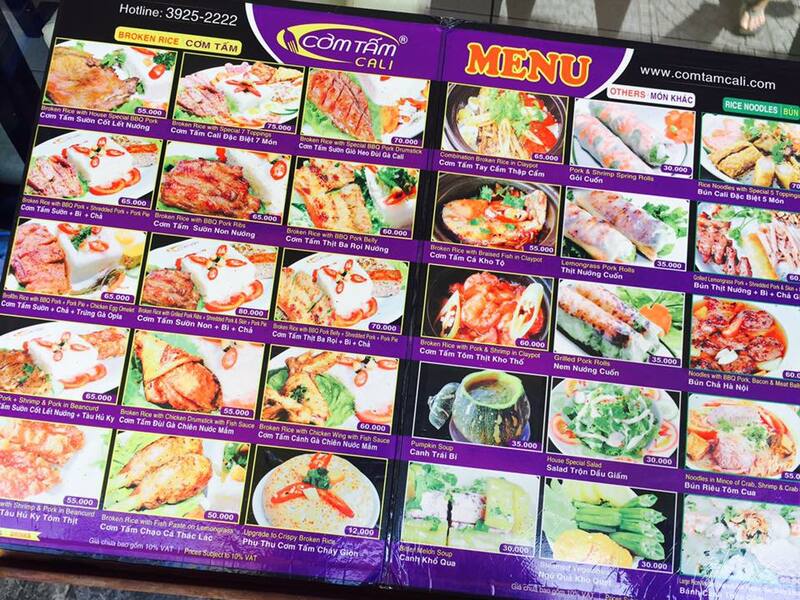 I mean, here we are very much excited to eat Vietnamese food but we got overwhelmed with the choices around us. So after checking more than several options, we ended up in a French Cafe called "Une Journee A Paris." Will write a separate post about it, stay tuned. 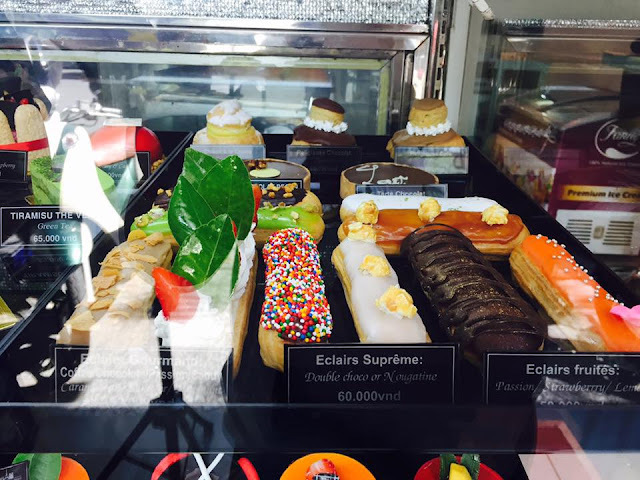 Actually, we got attracted to the cakes and pastries. 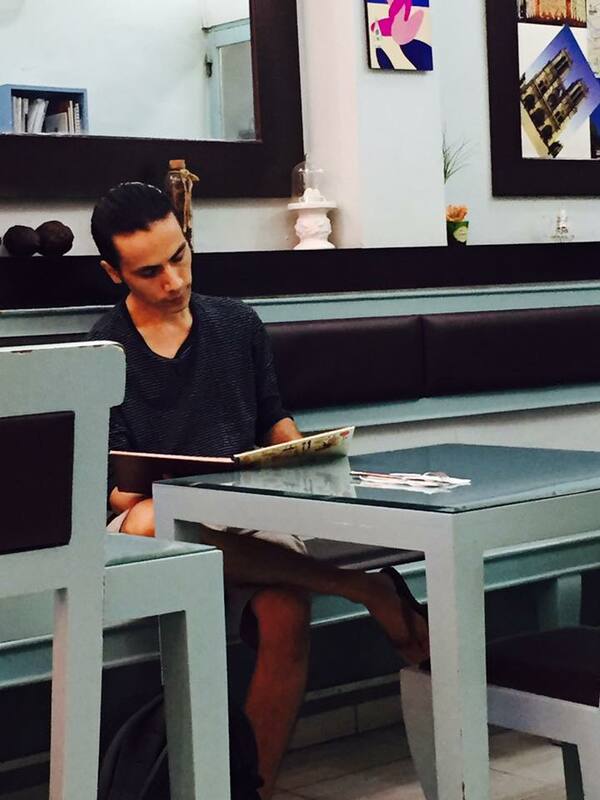 We also got lucky because aside from the delicious breakfast that we have, we also saw this French "hottie." ;) Something funny also happened as I was checking the Ho Chi Minh map that I got from the hotel. I was intently reading the map and trying to figure how to walk to the nearest landmarks .. but you know how maps are, the letters are small and I am having a hard time reading it. Then I espied a big one on the wall so I hurriedly went there to check it. But I find it more confusing. Then "hottie" spoke to me saying-- "Oh, that's a different map. That's a map of Paris!" Okay, I am officially mortified. My friend almost died laughing. But then again, at least he spoke to me- hahaha. So after my boo-boo moment with "hottie," we went back to the hotel to freshen up and then went out again to check out Lucky Plaza which was just at the other end of Ben Tanh Market. Lucky Plaza is where you will find cheap North Face bags and jackets, Kiplings, and a whole lot more. After Lucky Plaza, we crossed the street to Takashimaya Mall. And it was there that I suddenly found myself in Japan. 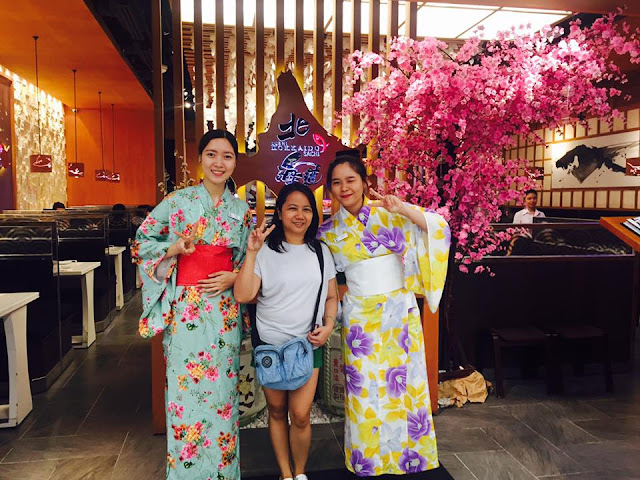 I mean, Takashimaya Mall has about 80% of its stores and restos dedicated to Japanese brands. 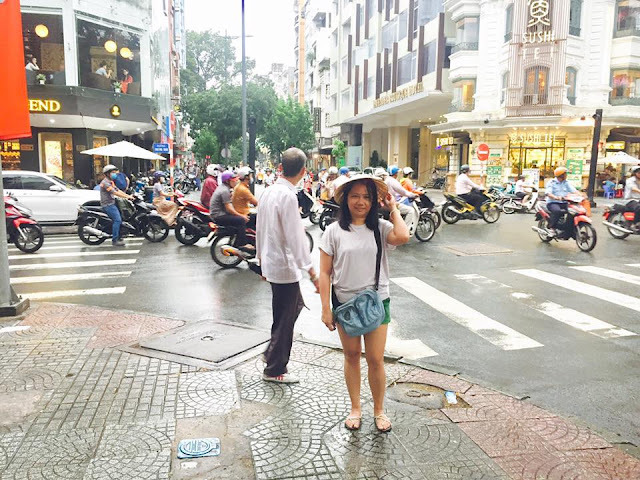 We planned to visit the Saigon Opera House but ended up staying in Takashimaya because it was pouring cats and dogs. After going around the mall again, we decided to go back to the hotel and rest until the rain stops. So here's a photo of me sporting my "Non La" or Vietnamese hat. See the motorcycles? In Ho Chi Minh, you can actually count the cars or trucks but not the motorcycles. Went back to Lucky Plaza and Takashimaya but wasn't able to find anything that we like so we played tourist and marveled at the well-lit Ho Chi Minh City Hall. 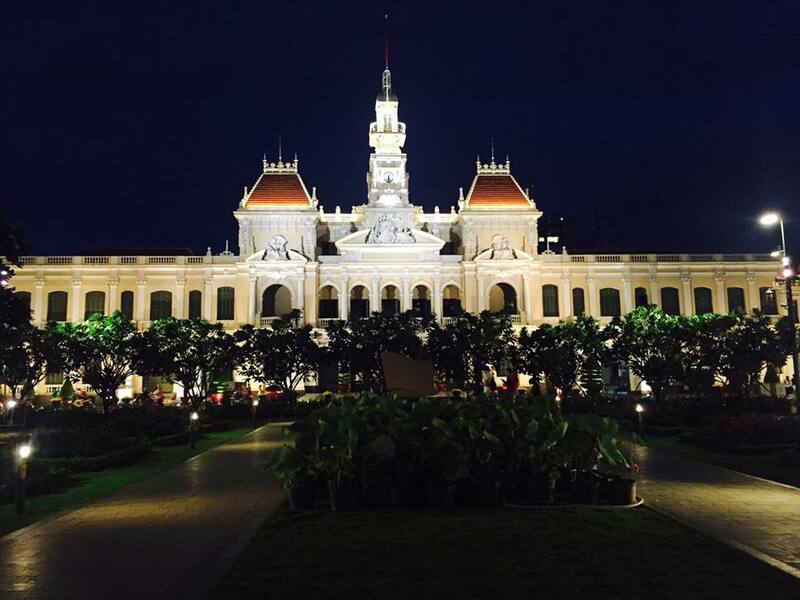 I also have a memorable tale while taking photo outside the gardens of the city hall. We got the scare of our lives by the croaking frogs! You would think that frogs are cute and small but the ones we heard sounded like huge, huge cows. No kidding. But it was fun to pose in front of the city hall while being scared of the unseen frogs at the same time. 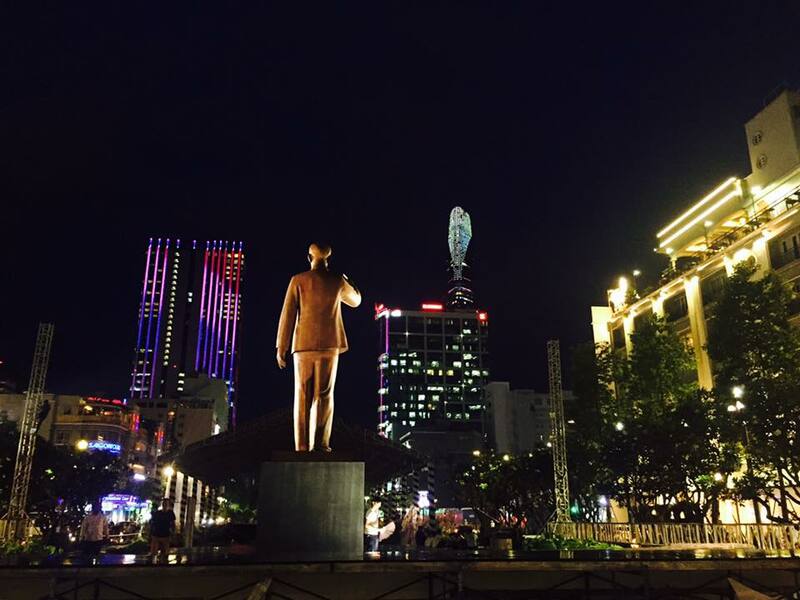 And if there's something that I failed to see in Ho Chi Minh City, it was the statue of Ho Chi Minh himself. It was kinda sad because I didn't realize that I was standing at the back of Ho Chi Minh when I took this photo. My eyes was focused on the colorful tall building. Oh wells, at least I have a reason for wanting to travel back to Ho Chi Minh City again.